More than four years have elapsed since I began collaborating with Patrick Bowen on the transcription, annotation, and biographical sketches for Letters to the Sage. But only last week did I finally get to Osceola, Missouri where Thomas Moore Johnson, Sage of the Osage, was born and spent most of his life. This visit followed the biennial convention of the Church of Light in Albuquerque, where a three hour preconference was devoted to Johnson and his correspondents. That presentation will be the source of several future updates to this blog. After the conference and before the visit to Osceola, I was able to meet Patrick Bowen at last after four years of collaboration, while visiting friends in Colorado. I am very grateful to Mary Ann Johnson Arnett, a great-granddaughter of Thomas Moore Johnson, and her husband Jim Arnett for welcoming me to their Kansas home where they have collected memorabilia of the Johnson family and St. Clair County that whetted my appetite for the next day’s visit to Osceola. 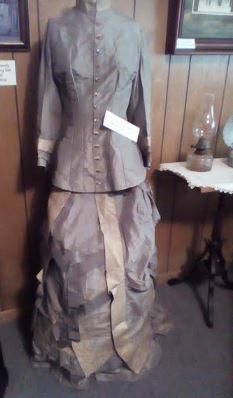 Before visiting the Johnson Library and Museum, the Arnetts took me to the St. Clair County Historical Society Museum just off the quaint town square. Welcoming us to the museum was Osceola resident and author Meredith Anderson, who with his wife Linda has written more than a dozen books many of which focus on 19th century Missouri. 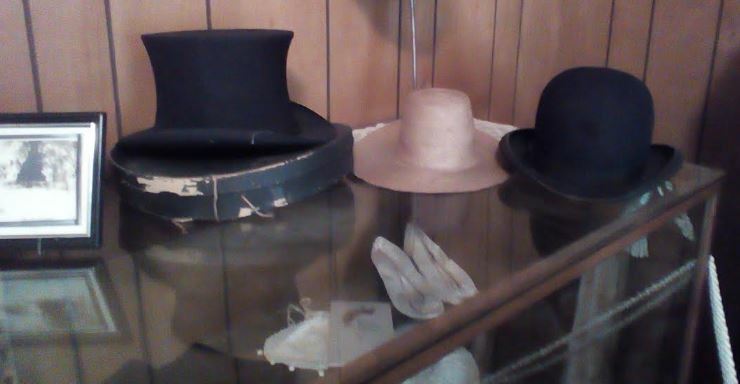 Downstairs exhibit space is broken up into several rooms, one of which is devoted to the Johnson family of Osceola, which include the wedding dress of Alice Barr Johnson, wife of TMJ, and a top hat that he wore. 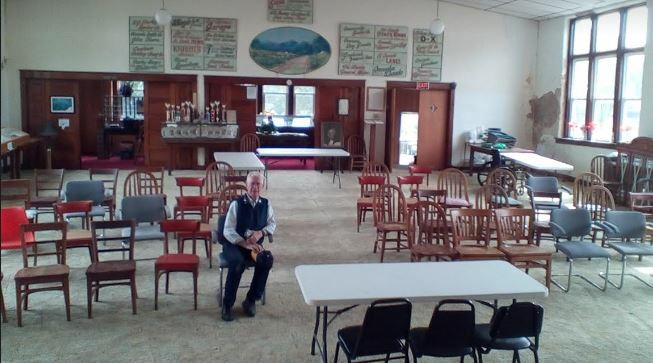 The upstairs of the former church building contains a large meeting hall, and the picture above shows Jim Arnett in the meeting hall. 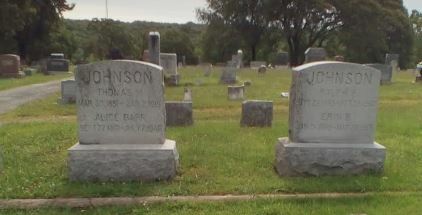 On the way to the Johnson Library and Museum, we stopped at the cemetery where Thomas and Alice Johnson are buried, next to the gravesite of their son and his wife. We then proceeded to the Johnson Library and Museum which overlooks the former Osage River which is now a branch of Truman Lake. I have previously posted a YouTube video of Tom Johnson’s tour of the building, but having him lead me through the buildings in person was a great honor and a memory I will keep the rest of my life. At the end of the tour we all had an unexpected surprise from Larry Lewis, whose collateral ancestor Edwin Lewis is mentioned in the Letters as the only Osceola friend of TMJ to follow him into both the Theosophical Society and the Hermetic Brotherhood of Luxor. 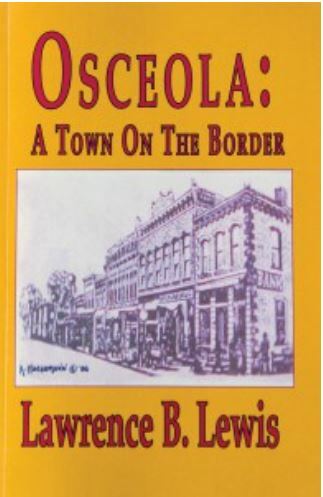 Larry is author of a new history of Osceola, and just that morning he had learned by email that his book had been nominated to the State Historical Society of Missouri for best book of the year on Missouri history. I have just gotten back home and not yet begun the book, but Larry pointed out to me on page 90 he mentions Letters to the Sage, names Patrick and me as coeditors, and gives publishing information. This is a big milestone for us, the first new book in which LTS is mentioned. I would have expected it to be in some academic tome but being mentioned in a book about Osceola from someone intimately acquainted with the TM Johnson descendants is ten times more gratifying. Before heading back home I enjoyed lunch with Larry and his wife Ruth and the Arnetts within sight of Osceola’s town square, and learned even more about the town’s history. Here is a review of the new book. Any small county seat would be fortunate to have its stories told by a native with Mr. Lewis’s qualifications. A descendant of the earliest settlers of St. Clair County, he spent ten years of childhood there before being relocated by his father’s wartime employment in Connecticut, and then spent most of his adult life elsewhere. Returning for good after retirement from the Episcopal ministry in 1997, he has been involved in many aspects of town life, including becoming a founding board member of the Johnson Library and Museum established in 1999. His accounts combine the nostalgic glow of family memories and objective description of disasters and decline following the 1861 burning of the town by Kansas Jayhawks and the creation of Truman Lake in the 1970s which ruined what had once been a lively waterfront district on the Osage River. In his book published later in 2016, Mr. Lewis brings the unique perspective of an Osceola resident with family lies to the Johnsons to his own work which combines memoir, Civil War history, ecological commentary, and thoughts about the present and future of his home town. I highly recommend the book to anyone who has taken an interest in Thomas Moore Johnson.